Want a chocolate glaze that you can put on absolutely everything? Want a chocolate glaze that hardens a little after you spread it on? 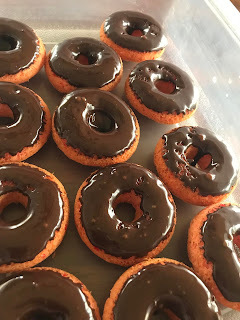 Want a chocolate glaze that you can easily change to be thick or not so thick? Me too. That's why I created this one. With four simple ingredients and a little water, you'll be glazing everything in sight. I'll leave the details on that up to you. 1. Whisk powdered sugar and cocoa powder together in a large bowl. 2. Add in corn syrup and vanilla, mixing thoroughly. 3. Pour in water, a little at a time, until the glaze is your desired consistency. 4. Dip, spread or drizzle this amazing glaze. Store any leftovers (yeah, right...) in an airtight container in the refrigerator.